Do you want to buy someone a gift? Are you having trouble deciding what they would like? 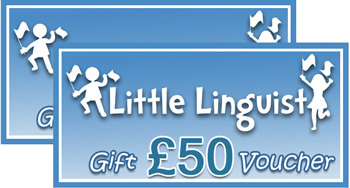 Are you looking for the perfect prize for your teachers or pupils? Little Linguist gift vouchers allow the recipient to choose their own gifts from our complete range of products, making them suitable for absolutely everyone. (if the value of your order is greater than the value of the gift voucher(s), you may pay the balance by credit or debit card). Simply add to your basket and once you've checked out, we'll deliver your personalised gift voucher(s) by email to whoever you choose!